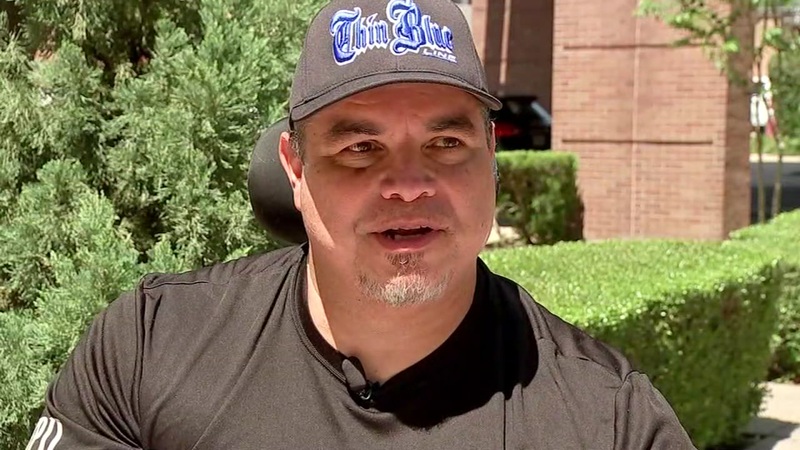 Officer Ronny Cortez remains optimistic weeks after shooting. HOUSTON (KTRK) -- A wounded HPD officer received a 100 Club donation Friday afternoon. Officer Ronny Cortez was one of two Houston Police Department officers shot multiple times as law enforcement pursued burglary suspects through a southwest Houston neighborhood. Cortez, a 24-year veteran of the department, lived with his family only a few homes down from where the burglary occurred on the 8700 block of Sterlingame. Cortez was searching the area with a second officer, 10-year veteran Officer Jose Munoz, when they were both shot multiple times by at least one armed suspect, in February. HPD Chief Acevedo briefs media on police officers who were shot. Cortez was transferred to Memorial Hermann-Texas Medical Center in critical condition with his wife by his side. He was shot several times in the stomach, and a bullet remains lodged near his spine. According to Ray Hunt with the Houston Police Officers Union, Cortez was wearing a tactical bulletproof vest at the time he was shot, but the bullet is believed to have entered Cortez's body beneath the vest.